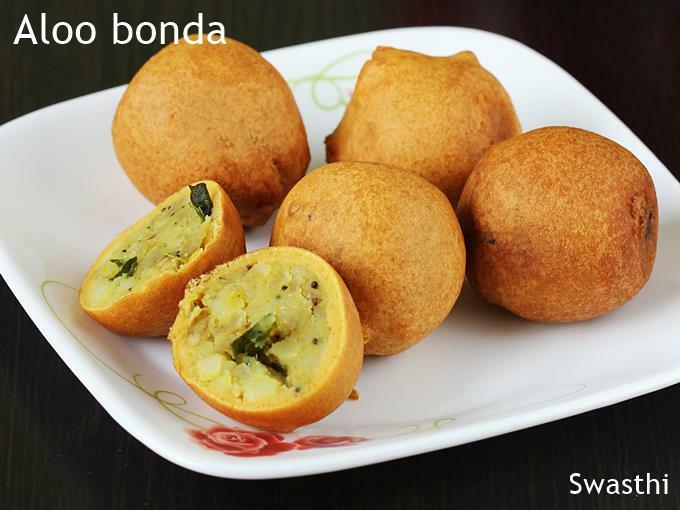 Aloo bonda recipe or potato bonda is a popular South Indian snack and a street food. These are served in almost all tiffin centers and restaurants too for the evening Tea time snack. 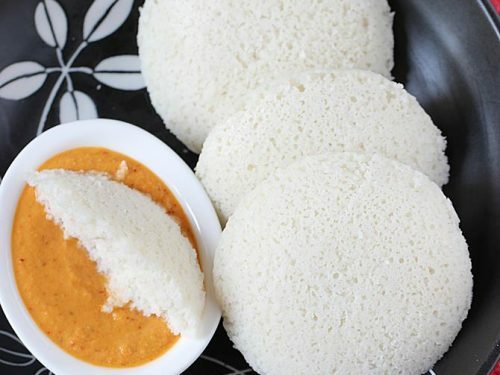 These originated in the Udupi hotels and eventually became one of the most common on all restaurant menus since they are loved by many. Vegetable bonda, Crispy mysore bonda , Andhra punugulu and egg bonda are similar other bonda recipes on the blog. 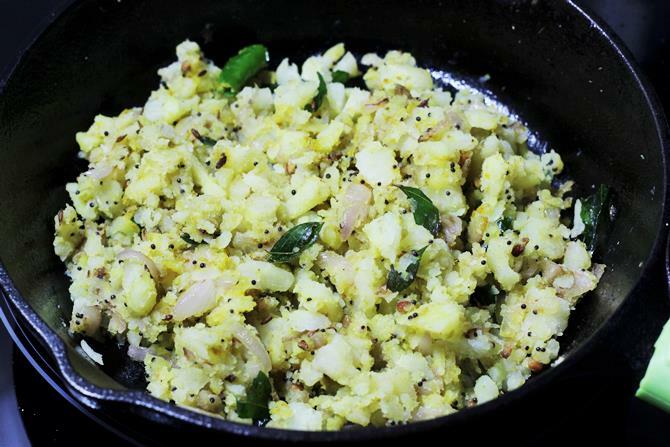 To make aloo bonda, first boiled potatoes are seasoned and spiced. Then dipped in gram flour batter and deep fried to golden. 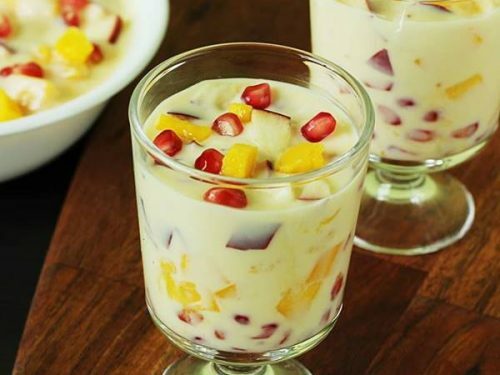 These are very good to make on weekends or during festivals or when you have guests home. 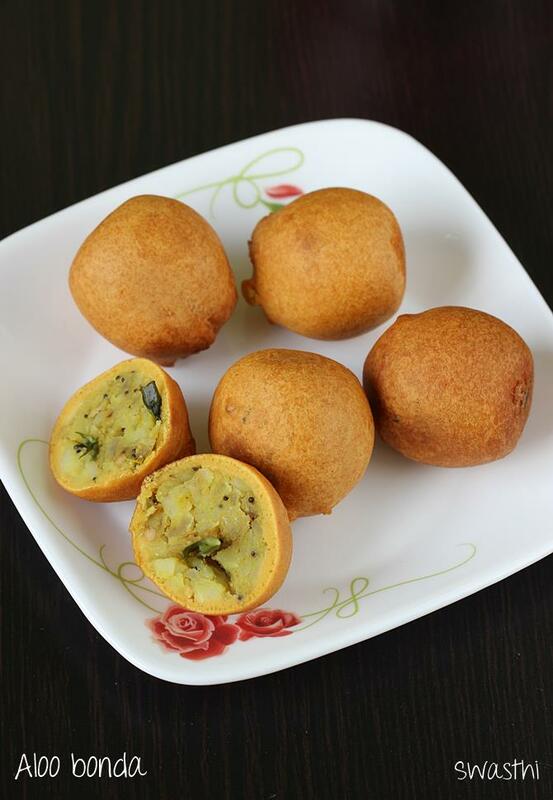 Aloo bonda is a South Indian version of the popular Maharashtrian snack Batata vada. 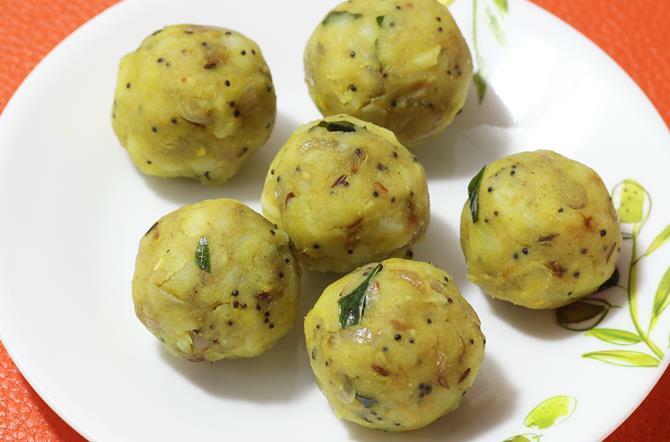 Usually aloo bonda is made simple just with aloo and onions, but some restaurants also make with capsicum and peas. 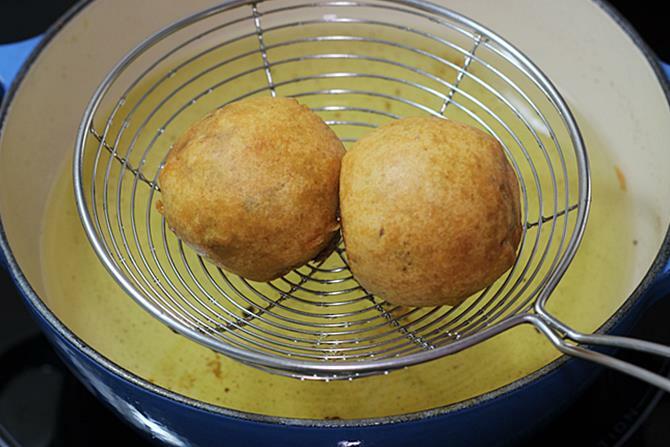 You can serve these aloo bonda with coconut chutney or with masala tea. 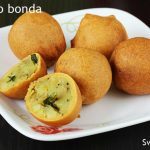 South Indian aloo bonda recipe – Deep fried snack made with spiced potato balls from South Indian cuisine. 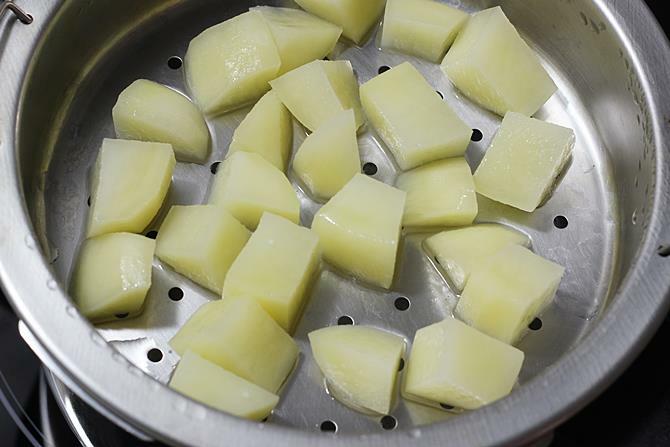 Steam or boil potatoes without making them mushy. You can boil in a pot or cooker. Pour oil to a hot pan. Add dal, mustard and cumin. Fry until the dal turns golden. Saute ginger just for 30 secs. Next add onions,salt, curry leaves and green chilies. Fry them. 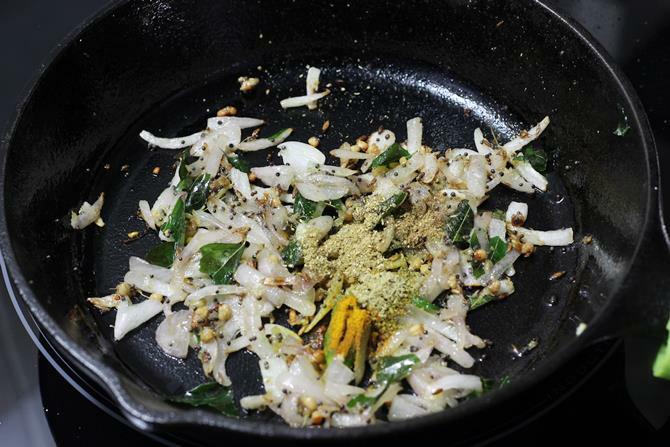 When the onions turn golden, add the turmeric, garam masala, coriander powder and saunf. 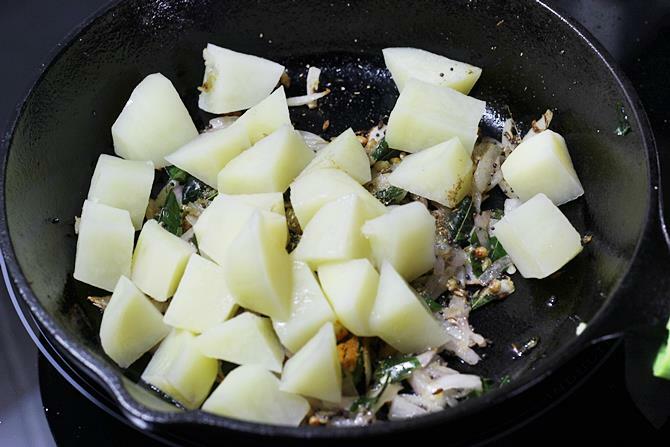 Add potatoes and mash them a bit without making them mushy. Mix well. 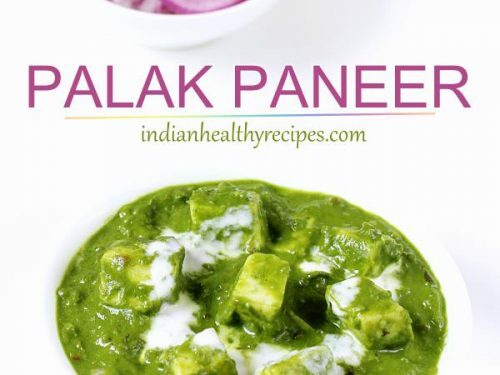 Sprinkle lemon juice and coriander leaves. Cool this and make 6 to 8 balls. 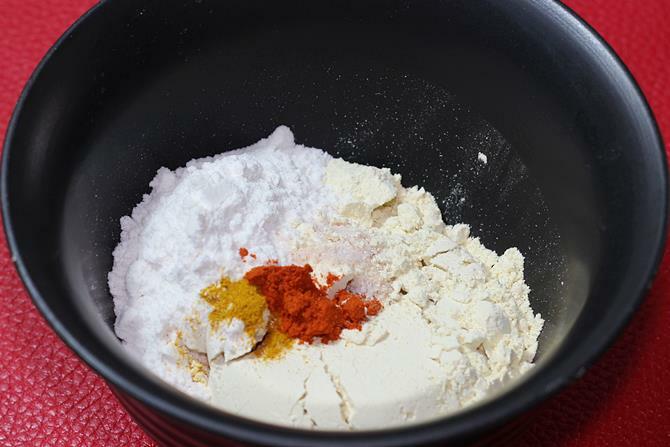 Add besan, rice flour, salt, chili powder and turmeric to a large mixing bowl. 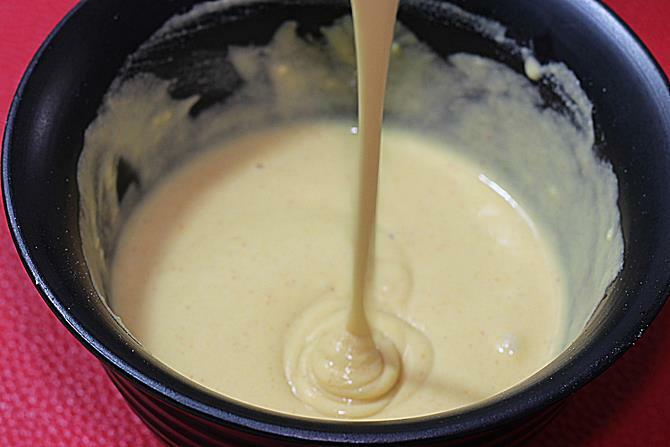 Pour enough water little by little and mix it well to make a batter that is neither too thin or nor too thick. The batter must be moderately thick and smooth. When the oil is hot enough, do the heat test by dropping a drop of batter. It must raise in the oil slowly and should not sink or turn brown quickly. 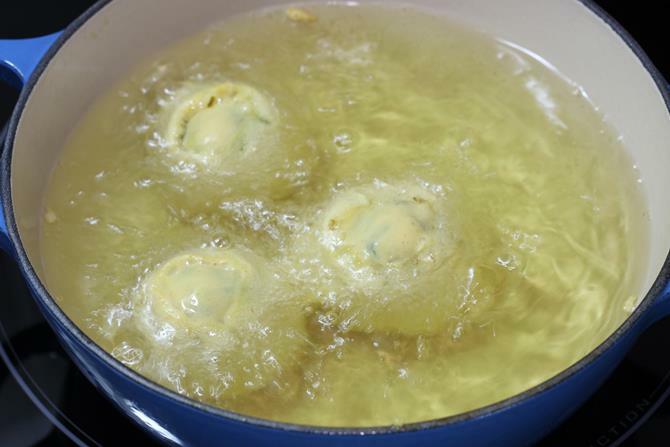 With the help of a tbsp dip each ball in the batter, swipe off the excess and drop in the hot oil. 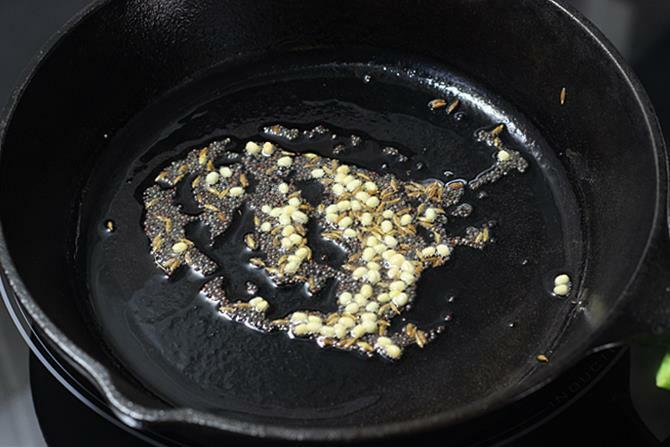 Each batch you can fry about 3 to 4 balls depending on the size of your pan and oil used. After a minute begin to stir and fry until golden. Repeat making all until all the balls are done. Drain the golden fried aloo bonda on to a kitchen tissue. 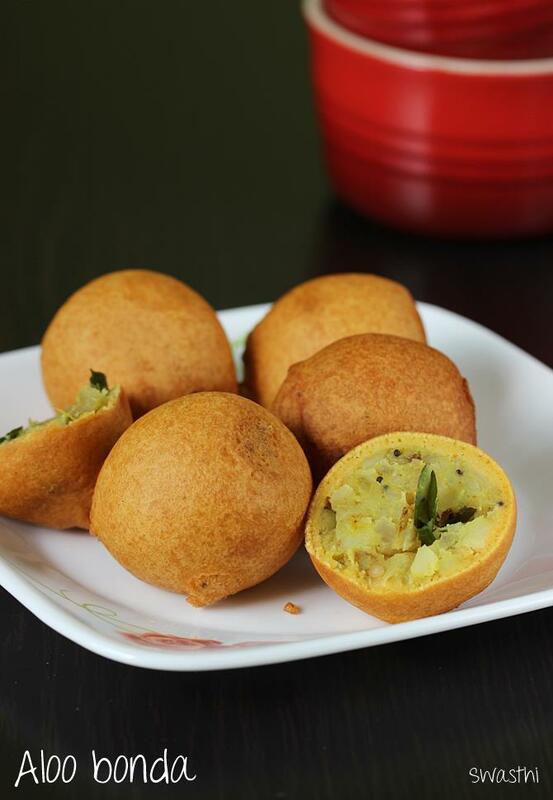 Serve aloo bonda hot or warm with chai or chutney. 1. Boil or steam potatoes till just done. Do not cook them until soggy. 2. 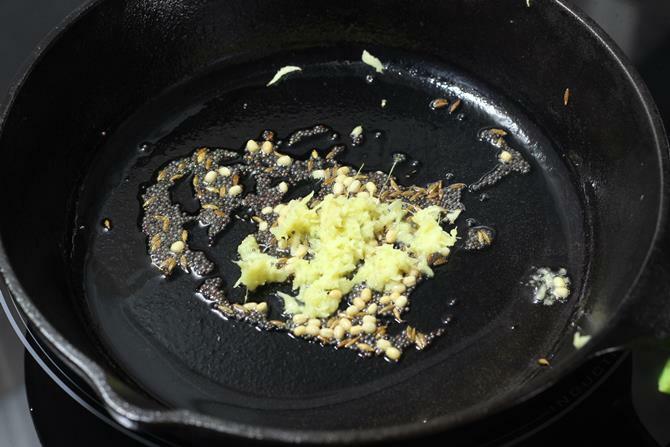 Add oil to a hot pan and add mustard, cumin and urad dal. Saute until the dal turns lightly golden. 3. Add hing and ginger. Stir it. 4. 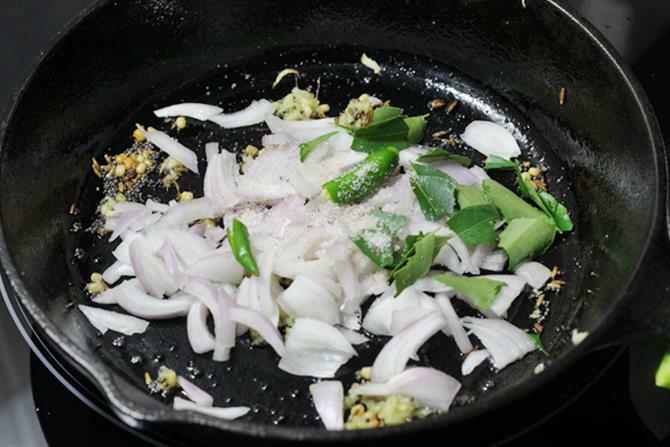 Add onions, curry leaves and green chilies. Sprinkle salt. 5. Fry until the onions turn golden. Add coriander powder, turmeric, saunf powder and garam masala (optional). 7. Mash them and add lemon juice. 8. Saute until everything is just well combined. Add coriander leaves if you have. Taste the mixture and make sure there is enough salt in it. 9. Cool the mixture and divide to 6 to 7 balls. You can even make 8 if you want smaller ones. 10. Begin to heat up oil in a kadai. 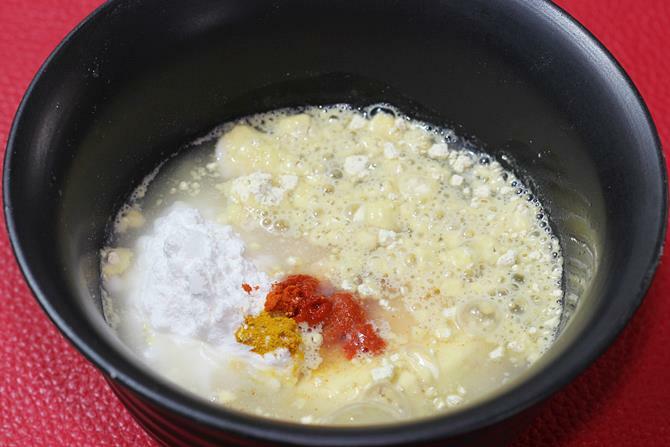 Add besan, rice flour, chili powder, turmeric and salt to a bowl. 11. Add enough water and make a thick batter. I used about half cup and 1 tbsp. 12. 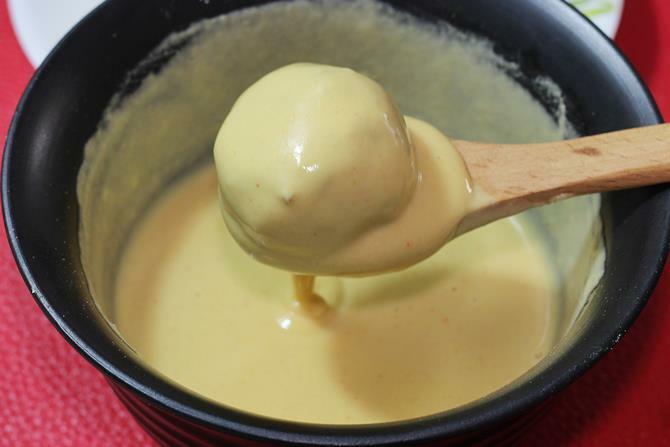 Make a thick and smooth batter. If the batter is runny then you may add more flours and mix. Taste this as well. It has to be slightly salty. 13. When the oil turns hot, do the heat test to check if the oil is hot enough by dropping a tiny amount of batter in the oil. Firstly, the batter must raise slowly and should not sink. When it is ready drop each ball in this batter. 14. 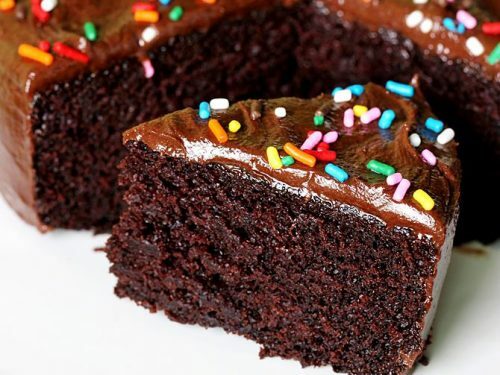 Coat it well with the batter. 15. Drop in the hot oil. Stir gently after a minute and fry until golden. 16. Drain on to a kitchen tissue. 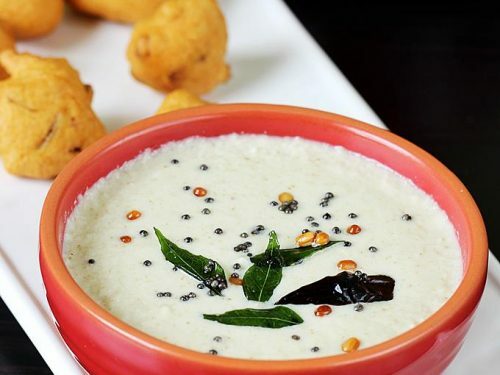 Serve aloo bonda hot or warm with chutney or masala chai. 1. Balls separated in batter – It’s just a binding problem. a)The aloo balls will break to pieces if the mixture is too dry. 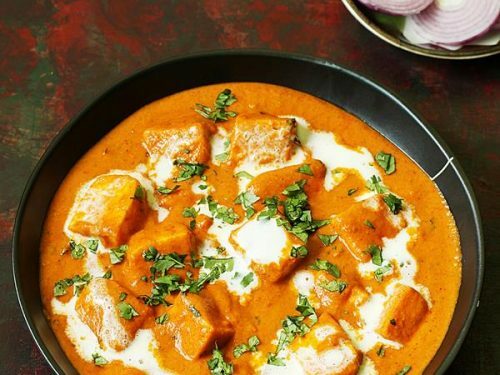 b) The aloo ball just gets mushy once they are dropped in the batter. This indicates there is too much moisture in the potatoes. Easy way to fix – Problem a) Mash a portion of the mixture very well so that it turns mushy and binds well. Problem b)Add 1 to 2 tbsp powdered poha and set aside. If the aloo bonda mixture is not right then just don’t proceed further to fry them. 2. 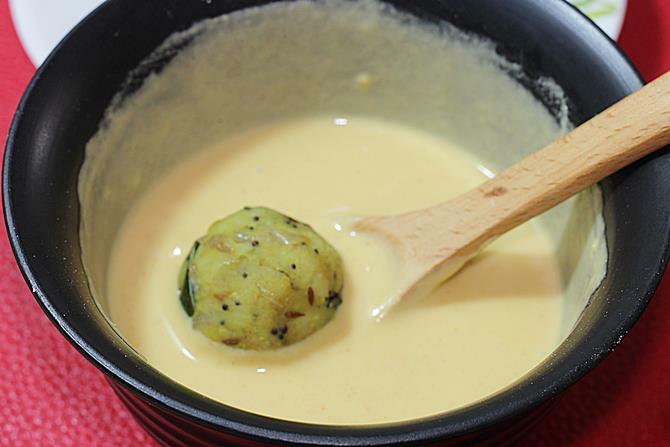 The batter did not coat the aloo properly – This happens if the consistency of batter is not right either too thick or too thin. You can check this video of batata vada. I have shown the consistency in the video. Would you please clarify how much urad dal is used and if it has to be soaked in water overnight? Thanks. You can use 1 tsp urad dal. It is not soaked and is used dry. 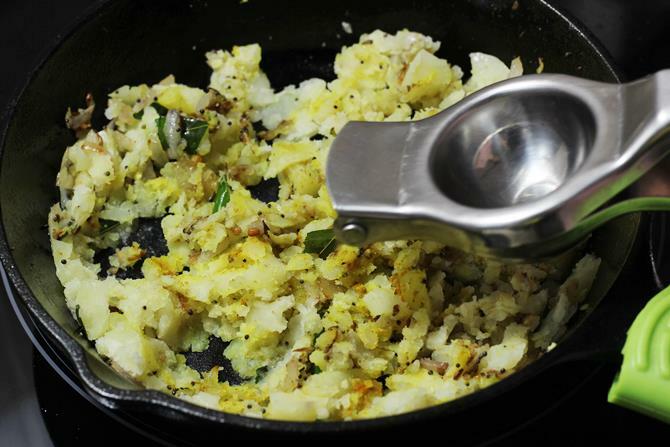 It will get roasted and turns soft on its own when you put in the moist boiled potatoes.